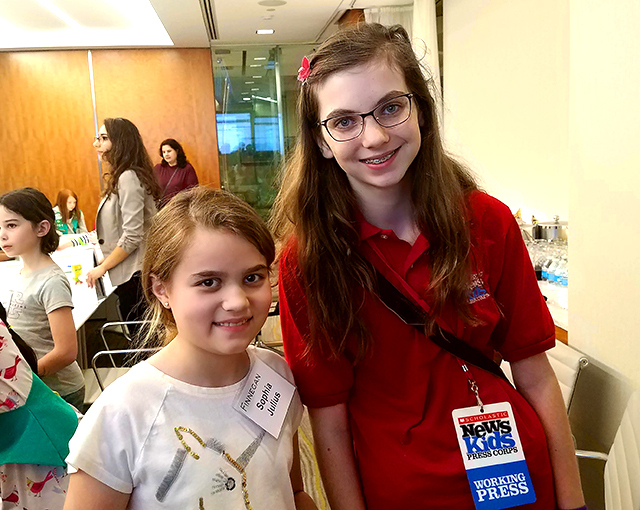 A New Badge for Girl Scouts | Kid Reporters' Notebook | Scholastic Inc.
Lilian with Sophia Julius, a Girl Scout and aspiring inventor, at a STEM event in Washington, D.C.
What do you get when you crowd about 70 Girl Scouts into a room? Inventions! Lots of them. Earlier this year, Finnegan, a law firm in Washington, D.C., hosted an interactive event for the Girl Scouts on the topic of intellectual property (IP). The impetus was to get more girls interested in STEM subjects (science, technology, engineering, and math). Those who participated in the event earned an IP badge. After experts described their experiences in STEM-related careers, the young inventors came up with their own innovations—everything from an anti-cheating device to an instrument that lets you see into a horse’s brain. Stations were set up to show the Girl Scouts how to use trademarks, copyrights, and other legal instruments to protect their ideas and inventions. One station allowed each girl to design and make her own jar. Elizabeth Doherty, who oversees the policies for examining patents at the United States Patent and Trademark Office, talked about kids who had already filed for patents. When Marissa Streng was 14, for example, she invented a dog dryer called the Puff-n-Fluff. Marissa now has a website and sells her product, just like any adult. At the Finnegan event, nine-year-old Nola Levengood of Alexandria, Virginia, proposed creating hair dye in the form of bubbles. You could apply the solution in the shower, and when the bubbles popped, a colored liquid would run out and dye your hair. Sophia Julius of Fairfax, Virginia, designed a saddle that would aid horses and riders alike. If the saddle turned green, that would mean the horse wanted more exercise. If it turned red, the rider would know that the horse needed a break. Esther Lim at a STEM-related event for Girl Scouts at Finnegan, a law firm in Washington, D.C. Lim, who is a partner at the firm, specializes in intellectual property. Throughout the day, there seemed to be a common theme—a dislike of math. Many of the girls agreed that math has too many formulas and rules. Nora Lim Yang, 9, of McLean, Virginia, was an exception. She likes math, science, and “figuring out how things work,” she said.